“Apocalypse” is the latest album from German power metal band Primal Fear and it was released on 10th August by Frontiers Music. 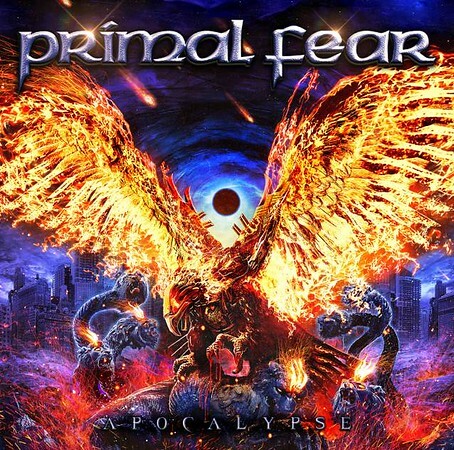 Regular visitors to the website or listeners to the NI Rocks Shows won’t be surprised to see a recommendation for “Apocalypse” as Primal Fear are regularly featured on the Shows and this is now the fifth album from the band that I’ve posted a recommendation for in the past five years. A few tracks from the new album have featured on the Friday NI Rocks Show already – “Hounds of Justice” on 25th May, “King of Madness” on 6th July and “The Ritual” on 17th August. Primal Form was formed by singer Ralf Scheepers and bass player Mat Sinner in 1997 and “Apocalypse” is the band’s twelfth studio album. Their debut was the self-titled release in 1998 and the eleventh was “Rulebreaker” in 2016. Since then the band has also released their second live album (“Angels of Mercy – Live in Germany”) and their second compilation album (“Best Of Fear”). The album is available in numerous versions, including red or blue vinyl. The standard CD version has 11 tracks whilst the expanded Digipack has 3 additional bonus tracks and a DVD. Primal Fear are singer Ralf Scheepers, bass player Mat Sinner, guitarists Tom Naumann and Alex Beyrodt, guitarist and keyboard player Magnus Karlsson and drummer Francesco Jovino. Naumann was one of the founding members of the band along with Scheepers and Sinner but has left the band for other projects on a couple of occasions.